On a Tuesdaymorning at 8 am we said to eachother: "Bye bye, see you at 2 pm at Eataly". We were meeting the Dutch NY local Danielle there for lunch. Before that Daphne went to check out Harlem and I wanted to go to the Upper East side. Eataly's address was in my smartphone and we had made eachother an ICE contact, so nothing could go wrong. Or could it? Hell yeah! The Iphone quit on me. Totally out of the blue while taking a picture. Quit as in drop dead, didn't react at all. Even warming up at Starbucks (it was freeeeeezing outside) did not help, nor did the charger that someone let me use. Luckily the Upper Eastsiders knew about Eataly and they pointed me in the right direction. After a 1,5 hour downtown walk I arrived there. And then was ready to panic. Because it is such a big place and there are so many entrances and exits.....how on earth would I find Daphne here? I decided I'd first take a look around and then...well, what do you know....scream/shout.....there she was...right in front of me. 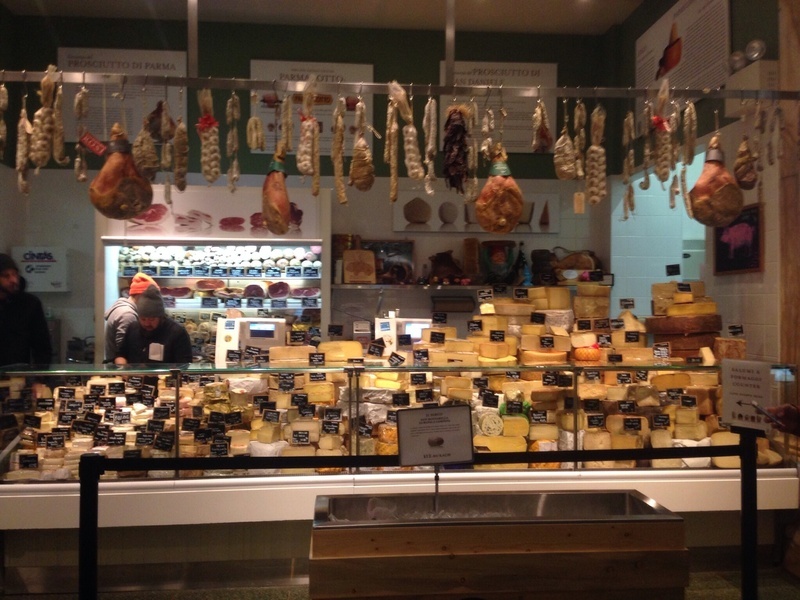 So, why would you want to go to Eataly? Well, because it's a great place to get coffee/lunch/dinner or just a good glass of whine with an oyster on the side. New York style Italy and a favorite place to meet & greet for the locals. Upstairs is Birreria (a so called beer garden); a rooftop restaurant with lots of little tables and a long bar. La Birreria is open year-round with a glass-enclosed roof. The lunch we had with Danielle was great, as was the wine. Downstairs is an Italian supermarket, a wide selection of Italian cheese and wines and various restaurants with plenty of tables and bars to sit at. Le Verdure is the place to be if you feel like good vegetarian food. But meatlovers, fish, pasta of pizza addicts will also have a ball at Eataly. It's a luxurious Italian marketplace. Near the Flatiron building which perhaps was on your to-do list anyway? Eataly is located at 200 Fifth Avenue.